For thousands of goons, this is the last face they saw. Can a man's face be a moment? This one can. It's a photograph wrapped around a low-poly head to represent the angst-ridden gunslinger Max Payne. It's a picture of Remedy writer and designer Sam Lake, who chose to represent the character's deep pain at the loss of his family by scrunching up all the parts of his face at the same time. Should we do another take, maybe more brooding and serious? No, Sam. This is it, the expression Max Payne players will be looking at for 12 hours. Nailed it. It is the face of a man so cross his eyebrows have gone to war over the middle of his face. It is the face of a man engaged in a deep internal conflict with a bad curry that won't quit. It makes me unreasonably happy whenever I see it, and I have played a lot of Max Payne. I'm convinced it would have been a lesser game if the studio had used a more conventional look. It's part of Max Payne's oddball personality. It also reflects the make-do-and-mend nature of the first game's development. Faced with limited resources, the devs at Remedy just put themselves in the game to save money. 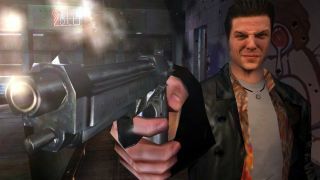 Max Payne 2 dropped the Sam Lake grimace for a new head based on the actor Timothy Gibbs. Lake still continues to appear in the surreal video skits you can find on televisions in Max Payne 2 and Alan Wake. It's not quite the same. It's a stretch to say that Max Payne was ahead of its time for giving its hero a real human face—among others, Bowie gave his likeness to Nomad Soul a few years before—but I think it's a rare example of a game character being memorable purely because of their demeanour. Max eventually evolved into a generic thug over time, but I'll always remember him as this goofy hardboiled hero, narrating his own revenge tale in overwrought Raymond Chandler-eque monologues.